Magic: the Gathering (M:tG) first hit the scene in 1993 and it was an immediate success. The concept: players could purchase random assortments of cards that could be used to design their own unique decks. Furthermore, these cards could be traded between the players creating a social interaction that went beyond just the playing of the game itself. At first, if you wanted the really good cards, you really had no choice but to rely on getting lucky with a booster pack or obtaining the cards in a trade. However, the explosion of the game’s popularity quickly led to reprints and this opened the door for a secondary market to emerge; a market where players no longer had to rely on luck to get what they wanted – they could just buy the singles. That eventually ruined the game for me. I first got into M:tG in 1996 and I played competitively for about 8 years. Eventually I began to notice that virtually every deck that I ran up against in competitive play started to look almost the same. As one deck would start to win tournaments people would share the deck construction online and everyone else would then emulate that deck. Buying and selling singles online only served to increase this phenomenon. Before long, M:tG had moved away from its glory days where you were relegated to buying a tournament pack and just working with whatever you had to a game that most benefited those with the deepest pockets. It had become “pay to win” and I just couldn’t keep up. I would sink all of my money into constructing a powerful deck only to have the next block of cards render that deck obsolete. And this experience has been echoed by many ex-Magic players over the years. Enter KeyForge: Call of the Archons. Designed by Richard Garfield, who also designed M:tG, KeyForge attempts to recapture that feeling of opening a tournament pack and just making the best of whatever you happened to get while simultaneously eliminating the same-y aspect that M:tG’s tournament scene sees these days. 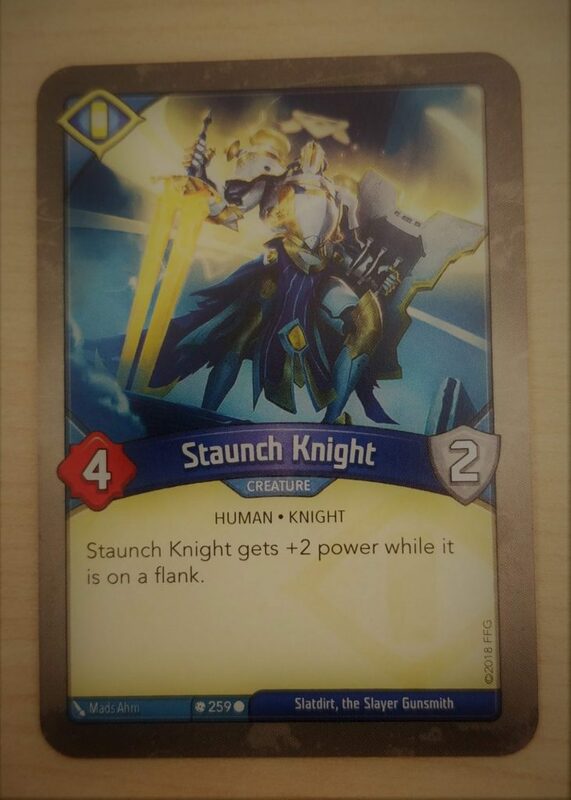 In KeyForge, every deck is unique. There is no card trading. Therefore, the actual playing of the game comes down to one thing and one thing alone: skill. The story is pretty thin, so I’m not going to go into it, suffice to say that the goal of the game is to be the first person to forge three keys. These keys are being forged so that the players can open vaults of ancient knowledge. When a person purchases a KeyForge booster, they are actually purchasing a unique 37-card deck. Each deck is comprised of cards from three different “houses” (of which there are 7 total). On a player’s turn, they will choose a single house to use for that turn. This includes cards of the chosen house that are both in their hand and already in play. 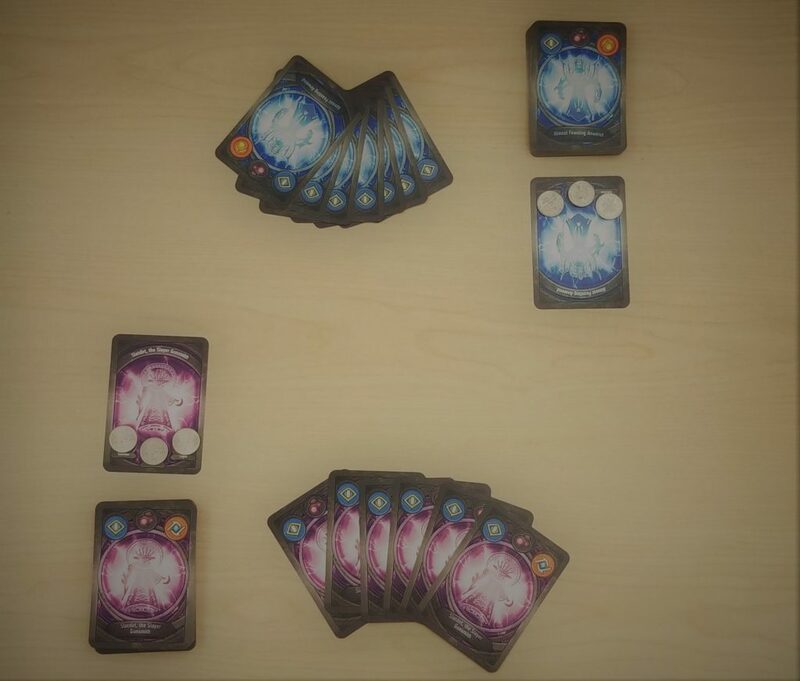 These cards are used to attack their opponent’s holdings and earn the precious Æmber that they will need to forge the keys needed to win the game. The first person who can manage to forge three keys in total wins the match. The setup for KeyForge is super easy. First, each player selects a deck. The Identity card is set aside and then the deck is shuffled and placed face down next to the Identity card. This is the draw deck. Next, a start player is chosen. That person will draw 7 cards from their deck to form their opening hand and their opponent will draw 6. 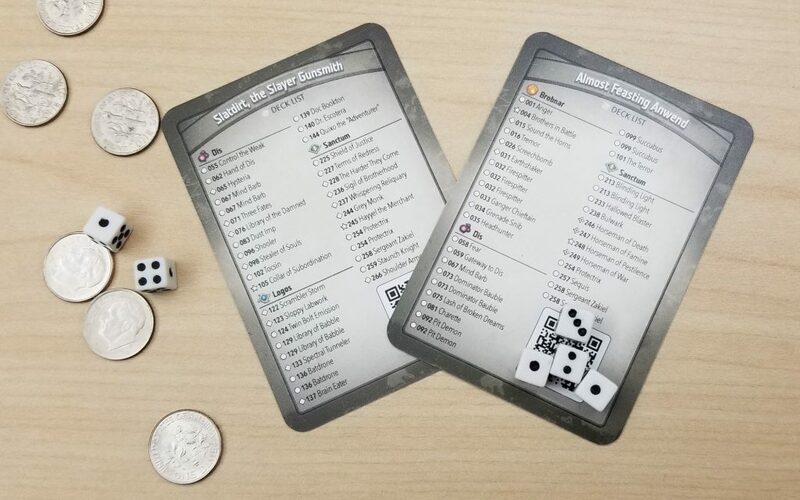 With the exception of the Key tokens, all of the counters and tokens and such can be set to the side because they won’t be needed immediately. The Key tokens are placed close by with their unforged sides facing up. Now you’re ready to play KeyForge: Call of the Archons! Play a card from your hand – unlike most other cards games similar to KeyForge, you’re not required to pay anything to play a card from your hand. You simply put it into play exhausted (turned on its side) or, if it is an action, perform its ability and then put the card into the discard pile. Creatures brought into play are played into the “battle line” and must be added to either the left or the right flank. This is important because some card effects specifically refer to this terminology. If a card played from hand has an Æmber symbol on it, the player adds one Æmber to their pool. In addition to its “Play” ability, this card will also net you 1 Æmber when played from your hand. Discard cards from your hand – you may discard as many cards from your hand as you wish that match the chosen house. At the end of your turn, you will be drawing back up to your hand limit of 6, so this is a way for you to cycle through your deck faster to hopefully get the cards that you want into your hand. Use cards played in previous rounds – at the end of the round, any exhausted cards are unexhausted (“readied” in game terminology). So, cards played in previous rounds can be used for their effects by exhausting them in this round. Non-creature cards will specify what they do and when they are able to do it. Creature cards, however, are a little more complicated, so we will talk more about them in their own section. Once the player has performed all of their actions, their turn comes to an end. They then ready any cards that were exhausted and draw up to their hand limit. Then it is the next player’s turn. Each creature card has a “power” which indicates how much damage the creature can do as well as how much damage it can sustain before it is killed off. Some creatures also have an armor value which dictates how much damage a creature can endure in a single round before their health starts being depleted. This creature has 4 power and 2 armor. Creatures also have special abilities that fire off at certain times. Some abilities trigger as soon as the creature is played from your hand. Some trigger before the creature is used to fight other creatures or after they have fought a battle and survived. Some creatures even have permanent abilities that will be in effect until that creature dies. Regardless of what the creature’s ability is, there are 2 things that every creature can do on their owner’s turn if they are readied: reap and fight. The creatures in KeyForge are your bread and butter. They are going to be your primary method of gaining Æmber and preventing your opponent from gaining theirs. Any readied creature of the chosen house can be exhausted to reap. This gains that creature’s controller 1 Æmber. Or, that creature can be exhausted to fight as long as the opponent controls at least one creature. Fighting requires you to target a specific creature. Each creature deals their damage to the other creature simultaneously. If a creature survives, any damage they have taken will remain between rounds. This means that multiple creatures can be exhausted one after the other to target the exact same creature. When creatures die, they are added to their controller’s discard pile. I went into KeyForge prepared to dislike it. My initial concern (and I imagine it’s a concern for a lot of people) was that the game is built upon a very unsteady foundation of randomness. 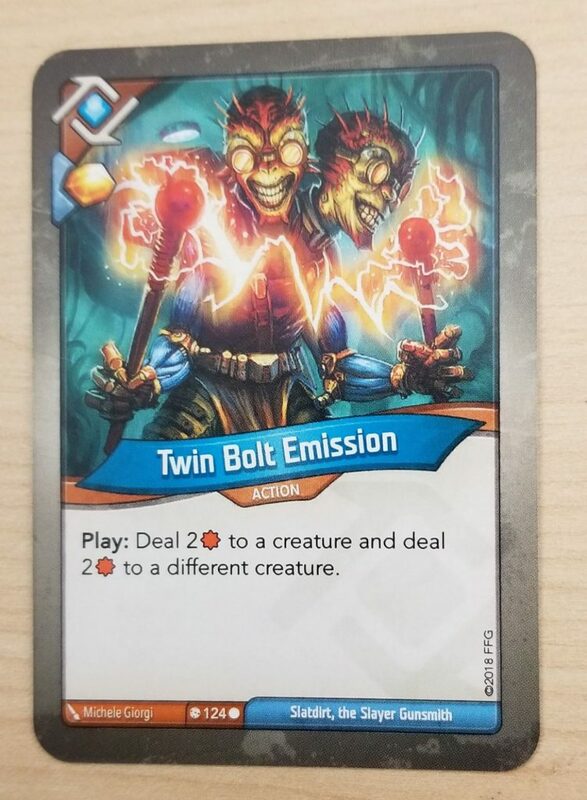 From the deck names to the card makeup to the artwork on the back of the cards, everything in KeyForge is very randomized. This will obviously lead to some decks getting luckier than other ones. Nothing would upset me more than buying a deck and getting a lot of subpar cards while my buddy’s deck is overflowing with the best of the best. Getting trounced time and time again isn’t very fun. Fortunately, Richard Garfield already saw this as a possibility, so he instituted the “chain” system. A player can have a total of 24 chains in all. For each grouping of 6 chains, the player will remove a chain and then draw one fewer card than they normally would whenever they would draw a card. This handicapping system is how you would bring two decks into line with each other. If one is doing too well, simply start it off with some chains. If this causes things to go in the other direction and it starts losing every game, simply reduce the number of chains until you reach an equilibrium where the two decks are evenly matched. It’s a brilliant and elegant solution to a mighty big problem. That solution does come with its own issue, though. Obviously, to fine tune the amount of chains needed, you’ve got to play those two decks against one another A LOT. This necessarily means that one person’s got to be prepared to lose multiple times in a row until you get everything worked out. I can’t speak for you, but I know that I am not the type of person that’s going to be okay with losing repeatedly in the name of science. That just doesn’t seem like much fun to me. It’s easier to just go out and get a new deck and hope that it fares better. Another challenging aspect of KeyForge is that it doesn’t play like any other game of this type that you’ve played before. Normally when you’re being attacked, you’ve got options you can use to defend yourself, but this just isn’t so here. The only thing that you can do when your opponent is attacking your creatures is to sit there and take it. This may not sit well with some and if that sounds like you, then KeyForge is probably not going to be a good fit for you. Just go into it knowing that this game requires a different kind of thinking in order to play well and you’ll do just fine. All in all, I’ve been rather surprised by just how much I like this game. I find myself thinking about it long after I’ve put my decks away. I’m always jonesing to get it to the table again. KeyForge challenges me the same way that M:tG does without the expensive price tag. I only own two decks and, really, that’s all I’ll ever need. I don’t ever have to purchase another deck if I don’t want to and I find that truly remarkable. The “unique deck” idea seemed weird to me at first, but after experiencing it for myself, I’m a true believer. I don’t think KeyForge is going anywhere anytime soon. This game is here to stay. Magic: the Gathering, you’d better look out. KeyForge is coming for you. I have rally enjoyed my plays thus far and have already won thanks to other players playing the wrong game. I constantly see folks fighting when they should be reaping. I cannot wait to get time with all of my decks and see how they play.